From a very young age, Daniel Libeskind (pronounced LEE-buhskinned) exhibited a sharp intellect and extraordinary talents. As a child in Poland, he discovered that he had considerable musical talents; he appeared on live Polish television at the age of six, playing the accordion. As a young man, having immigrated to the United States during his teen years, Libeskind abandoned his musical ambitions, devoting himself to a different type of creative expression: architecture. After studying to become an architect, he spent many years teaching and developing his theories of design rather than actually creating buildings. By the start of the twenty-first century, with one building to his credit—the Jewish Museum Berlin—Libeskind had proven that he could translate his teachings and ideas into a work of tremendous significance, and he came to be considered one of the world's most innovative architects. Libeskind was born in Lodz, Poland, on May 12, 1946, the year after World War II (1939–45) ended. Libeskind's parents, Jews living under the dangerous regime of Nazi Germany, had separately fled Poland when the war began. After reaching the border of the Soviet Union, both were arrested by the Soviets. They met and married in 1943, while in exile from their native Poland. After the war, they returned to Libeskind's father's hometown, Lodz, to find that nearly every relative, eighty-five people in all, had been killed during the Holocaust, Nazi Germany's systematic attempt to destroy the entire Jewish population of Europe. Like many Jews in postwar Eastern Europe, the Libeskinds found that the formal end of the Holocaust did not bring an end to violent anti-Semitism, or hatred of Jews, in their city. Libeskind told Stanley Meisler of the Smithsonian: "Anti-Semitism is the only memory I still have of Poland. In school. On the streets. It wasn't what most people think happened after the war was over. It was horrible." His parents wanted him to play an instrument, but moving a piano through the courtyard of their apartment complex would have aroused the hostility and resentment of the neighbors. Instead, Libeskind's parents bought him an accordion, an instrument that could be concealed in a briefcase. He excelled in his musical studies and earned some measure of fame at a very early age. "I arrived by ship to New York as a teenager, an immigrant, and like millions of others before me, my first sight was the Statue of Liberty and the amazing skyline of Manhattan. I have never forgotten that sight or what it stands for." When Libeskind was eleven, he, his parents, and his older sister immigrated to Tel Aviv, Israel. Upon moving to Israel, he switched instruments and began playing piano. Two years later, in 1959, he won an America-Israel Cultural Foundation scholarship, which enabled the family to move to the United States. They settled in a one-bedroom apartment in the Bronx, a borough of New York City. Libeskind continued to study music and to perform, but as he matured, he found music to be less and less satisfying. He told Paul Goldberger of the New Yorker, "Music was not about abstract, intellectual thought—it was about playing. I didn't find it interesting enough. I couldn't see spending my life on a stage." Craving a different kind of creative and intellectual exploration, Libeskind enrolled in the Bronx High School of Science. The following list indicates the architectural projects, both completed and ongoing, of Daniel Libeskind. The building name is followed by Libeskind's name for or description of the project, the location of the building, and the years of development; the projects are listed in chronological order. Jewish Museum Berlin, "Between the Lines," Berlin, Germany, 1989–1999. 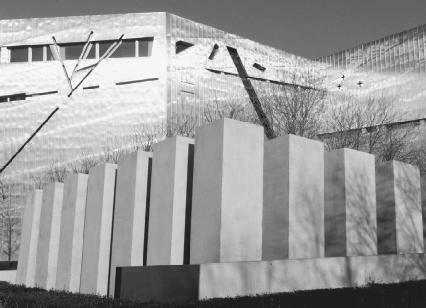 Felix Nussbaum Haus, "Museum ohne Ausgang," Osnabrëck, Germany, 1995–1999. Danish Jewish Museum, "Mitzvah," Copenhagen, Denmark, 1996–2003. Extension to the Victoria & Albert Museum, "The Spiral," London, England, 1996–2006. Imperial War Museum North, "Earth Time," Manchester, England, 1997–2002. Studio Weil, Private gallery for Barbara Weil, Port d'Andratx, Mallorca, Spain, 1998–2003. Jewish Museum San Francisco, "L'Chai'm: To Life," San Francisco, CA, 1998–2005. Maurice Wohl Convention Centre, Bar-Ilan, "The Book and the Wall," Bar-Ilan University, Tel Aviv, Israel, 2000–2004. Extension to the Denver Art Museum, "The Eye and the Wing," Denver, CO, 2000–2005. London Metropolitan University Post-Graduate Centre, "Orion," London, England, 2001–2003. World Trade Center Site Plan, "Memory Foundations," New York, NY, 2002–. Not long after completing high school, in 1965, Libeskind became a naturalized American citizen. That same year, he chose to study architecture, enrolling at the Cooper Union for the Advancement of Science and Art. Libeskind told Cathleen McGuigan of Newsweek that his pursuit of architecture seemed like a natural progression, as it is a field that "combines so many of my interests. Mathematics, painting, arts. It's about people, space, music." When the World Trade Center was under construction, Libeskind used to wander down to the site, as he related to Devin Leonard of Fortune magazine: "We used to come down here at lunch when the trade center was being built. It was the most incredible building in New York." During his college years, Libeskind married Nina Lewis, who would later become his business partner as well, running nearly every aspect of his firm as it grew in size and importance over the years. The couple would go on to have three children: Lev, Noam, and Rachel. After graduating from Cooper Union in 1970, Libeskind studied the history and theory of architecture at Essex University in Colchester, England, earning a master's degree there in the early 1970s. After completing his education, he briefly held jobs with standard architectural firms, but he felt stifled by what he viewed as a conformist attitude in such offices. He did not want to imitate other people's design ideas and architectural theories; he wanted instead to develop his own notions and encourage other young architects to think independently as well. He decided to pursue teaching. He taught at the University of Kentucky, and at universities in Toronto, Canada, and London, England, before accepting the job, at age thirty-two, as director of the prestigious Cranbrook Academy of Art in Bloomfield Hills, Michigan, a suburb of Detroit. In 1985, after seven years as director of Cranbrook, Libeskind moved to Milan, Italy, to found his own small school, Architecture Intermundium. According to Libeskind, as quoted by Stanley Meisler of the Smithsonian, he wanted the school to offer "an alternative to traditional school or to the traditional way to work in an office.... The school was between two worlds, neither the world of practice nor of academia." Libeskind was the only professor at his school, teaching about a dozen students at a time. In the nights following the September 11, 2001, attacks on the World Trade Center, architect Michael Arad, a New York resident who grew up in Israel, the United States, and Mexico, found himself walking the streets of the city, unable to sleep. He was surprised and moved to find impromptu memorials springing up all over the downtown area, evidence of New Yorkers' intense feelings of grief and loss. Within a few months, he had begun thinking of a way to design a public memorial to honor those who died in the attacks. His initial idea involved creating voids, empty spaces, in the Hudson River near the World Trade Center site. When he heard the announcement that a competition would be held to choose the designer for the World Trade Center memorial, Arad decided to enter. Well over five thousand people submitted entries for the competition. The jury, including noted architect Maya Lin (1959–), designer of the Vietnam Veterans Memorial in Washington, D.C., narrowed the entrants down to eight finalists. In January 2004, Arad's design was selected. Suddenly, the thirty-four-year-old architect was faced with a tremendous task. He was responsible for what could arguably be described as the most delicate aspect of the complicated World Trade Center redevelopment. His memorial, a highly public place that would be visited by millions every year, would also have to convey a sense of quiet intimacy for the many thousands of people who lost loved ones in the attacks. Arad's design involves converting the footprints, or foundations, of the destroyed twin towers into thirty-foot-deep reflecting pools. From ground level, the pools will appear as empty spaces, signifying the loss and absence of those who died there. Visitors will be able to descend to the underground memorial, where the names of those who died will be randomly arranged around the reflecting pools; the names of rescue workers will be highlighted with a special symbol. Beneath the reflecting pools, an interpretive center will be built that will house exhibitions and artifacts of 9/11, including personal belongings recovered from Ground Zero and crushed steel beams. The memorial will also include a private room where relatives of the victims can go to pay their respects. Upon leaving the underground memorial, visitors will enter a large public plaza. Initially Arad had designed this plaza to be fairly bare, and his design struck many as being too severe. After being selected as a finalist in the memorial design competition, Arad joined with California-based landscape architect Peter Walker (1932–) to refine his design. Among other changes, Walker greatly increased the number of trees and other vegetation that would fill the memorial plaza, the area surrounding the memorial. The park-like space will be filled with a variety of deciduous trees and other plants, reminders of the continuation of life in the midst of tragedy, as well as numerous park benches that will allow for rest and contemplation. The Jewish Museum in Berlin, Germany, designed by Daniel Libeskind. Jews, would have to be significantly represented. At the Daniel Libeskind Web site, the architect explains that he realized "the necessity to integrate physically and spiritually the meaning of the Holocaust into the consciousness and memory of the city of Berlin." Having lost so many relatives to the Holocaust, Libeskind felt a special connection to the project. The form the building takes—a long, angular zigzag—represents a sort of flattened, rearranged version of the six-pointed Jewish Star, or Star of David, which millions of Jews in Germany, Poland, and elsewhere were forced by the Nazis to wear on their clothing as a means of identification. The shape of the building was also derived from the locations of the homes of some important Berlin Jews. Libeskind plotted out these addresses, drew lines connecting them, and used the resulting shape as inspiration for the building's design. Libeskind encountered numerous delays in the planning and construction of the building, which was finally completed in 1999, only to stand empty for two years as various decision-making groups in Berlin argued over the exact purpose of the museum. During that period, more than three hundred thousand people came simply to walk through the empty building, drawn to Libeskind's startling, unusual design. On September 9, 2001, the museum, now filled with exhibits, opened to the public, becoming one of Germany's most-visited museums by the end of 2002. Made of reinforced concrete and covered in zinc, the Jewish Museum Berlin boasts many unique features. Libeskind conceived of an area known as the Voids, empty rooms that run the length of the building, separate from the exhibition halls. According to the Jewish Museum Berlin Web site, "The line of Voids, a series of empty rooms ... expresses the emptiness remaining in Europe after the banishment and murder of its Jews during World War II. The Voids stand for the deported and exiled masses, and for the generations that were never born. They make their absence visible." The museum also includes the Garden of Exile and Emigration, commemorating the hundreds of thousands of Jews who were forced out of Germany during the Nazi reign and acknowledging those who were able to make new lives in Israel. The garden contains forty-eight pillars filled with soil from Berlin; the number recalls the year, 1948, in which the state of Israel was established. A forty-ninth pillar contains soil from Jerusalem, the capital of Israel. Planted in each pillar are olive branches, a symbol of peace. Another part of the museum is the Holocaust Tower, an area found at the end of a hallway. After visitors enter the tower, a heavy gate clicks shut behind them, emphasizing the sense of finality and loss evoked by the Holocaust exhibits. The walls are bare concrete and the space is not heated, reminding visitors of the raw, inhumane conditions of the Nazi prison camps in which millions of Jews died. McGuigan of Newsweek described the Jewish Museum Berlin as "a slash, a wound in the cityscape—a zinc-covered zigzag, its windows diagonal slits. Inside, the spaces are haunting and disorienting." The museum drew international attention and acclaim to Libeskind, and he came to be counted among the most interesting and important architects in the world. In the Smithsonian, Meisler explained that "Libeskind is usually described in architectural books as a 'deconstructivist'—an architect who takes the basic rectangle of a building, breaks it up on the drawing board and then reassembles the pieces in a much different way." Meisler noted that Libeskind himself does not consider himself a deconstructivist; he points out his emphasis on "preconstruction as well as construction." In other words, Meisler wrote, "Libeskind collects ideas about the social and historical context of a project, mixes in his own thoughts, and transforms it all into a physical structure." His ability to create a building that has a practical purpose as well as a deep symbolic meaning contributed to the recognition he received for his innovative design of the Jewish Museum Berlin and also played an important role in future commissions. After completing the Jewish Museum Berlin, Libeskind received important commissions to design buildings all over the world, including the Imperial War Museum North in Manchester, England; an extension, known as the Spiral, to the Victoria & Albert Museum in London, England; the Danish Jewish Museum in Copenhagen, Denmark; and the Felix Nussbaum Haus, a museum devoted to a Jewish artist killed during the Holocaust, in Osnabrück, Germany. However, the accomplishment that brought Libeskind to the attention of millions in the United States and elsewhere was his victory in the contest to become the master site planner of the new development at the World Trade Center site, known as Ground Zero, in New York City. Competing against many of the world's most accomplished architects, Libeskind conceived a design that incorporated, in its every aspect, the significance of the tragedy that took place at that site on September 11, 2001, when terrorists crashed two jetliners into the twin towers of the World Trade Center. "But," he explained to Richard Lacayo of Time magazine, "we also want to reassert [the area's] vitality." While the jury that had been formed to award the commission did not actually vote in favor of Libeskind, choosing instead the team known as Think, led by Rafael Vinoly and Frederic Schwartz, Governor Pataki (1945–) and other important players, including the families of victims of the attacks, felt a strong connection to Libeskind's design, and he was declared the winner in February 2003. Libeskind's plan, titled Memory Foundations, included a number of features, all interconnected and serving to express his vision of the site as a tribute to the victims of 9/11 and as a landmark architectural project for New York and the entire United States. His original design designated large areas of open space, including the Park of Heroes as a tribute to those police, fire fighters, and rescue workers who lost their lives on 9/11. Another open space was called the Wedge of Light, a triangular area that, every September 11, would be bathed in natural light, unobscured by shadows from the surrounding buildings, between 8:46 A.M. , when the first plane struck one of the twin towers, and 10:28 A.M. , when the second tower collapsed. Libeskind's design specified that the seventy-foot-deep "footprints," or foundations, of the collapsed towers—where hundreds worked for many months after September 11, 2001, removing debris and searching for remains—would be left intact as sunken memorial space. Libeskind also wanted to leave standing the slurry walls, which made up part of the foundation of the twin towers, the only part of those buildings to survive the collapse. At the Web site of the Lower Manhattan Development Corporation, the organization that sponsored the search for the site plan designer, Libeskind is quoted as saying, "The foundations withstood the unimaginable trauma of the destruction and stand as eloquent as the Constitution itself, asserting the durability of Democracy and the value of individual life." His concept included a series of buildings to hold offices, residences, a performing arts center, and shopping centers; the tallest building was to be 1,776 feet, a number chosen by Libeskind to recall the year the United States gained independence from Britain. The shape of the building, which was to be topped by a tall spire, would echo that of the nearby Statue of Liberty. Upon winning the commission, Libeskind—the architect at that point of a handful of buildings, not one of which was a skyscraper—was faced with the enormous task of overseeing the design of a sixteen-acre parcel of land. These were no ordinary sixteen acres, however. Any major development in a large urban area like New York City presents a challenging array of obstacles for an architect, including political concerns, financial needs, the complications of working in a crowded city, and the wishes of the city's residents. The World Trade Center development added a new dimension to this complexity: for the families of the victims of 9/11, and for many others as well, the ground at this site is sacred, and the process for developing that land is charged with strong opinions and deeply felt emotions. 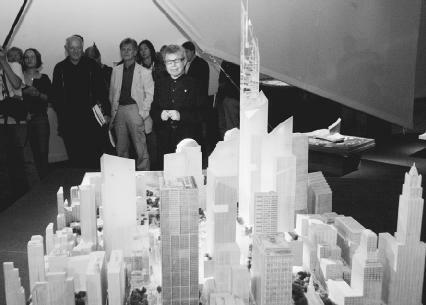 Daniel Libeskind (center) stands behind the model for his design to replace the World Trade Center. his every move, photographers snapped his picture, and his name appeared in the headlines of every major newspaper. Once the excitement died down, Libeskind was forced to confront the complexity of his role. He had to please a number of different factions, or groups, including the Port Authority of New York and New Jersey, the transit management group that owns the land; developer Larry Silverstein, who holds the lease on the property and who would be the recipient of the insurance payout from the twin towers' collapse; Governor Pataki and New York City mayor Michael R. Bloomberg (1942–), both of whom considered the development of the site as a key part of their political legacies; the Lower Manhattan Development Corporation, the government agency that had been created to oversee the rebuilding of Ground Zero; and the families of the victims. Libeskind found that, in addition to pleasing many different parties, he would also have to cooperate with other architects on the design of the entire complex. He had been chosen to develop the master plan for the site, but he had not been charged with actually designing the different parts of that plan. Silverstein had previously hired architect David Childs (1941–) to design the tallest tower of the site, which has been dubbed the Freedom Tower. Regardless of the fact that Libeskind had submitted his own design for the tower as part of his overall plan for the site, he was forced to collaborate with Childs on a design that would result in both men compromising their initial visions. The memorial at the site would also be handed over to a different architect. An international contest was held to determine the designer of the memorial, and Michael Arad (1969–), a thirty-four-year-old architect, was chosen in early 2004. Within a year of winning the opportunity to oversee the new World Trade Center complex, Libeskind's original plan had undergone dramatic changes. His tall tower had been changed completely by Childs; his suggestions for memorial space had been overridden by the design of Arad; plans for the slurry walls to remain standing had been scrapped due to engineering concerns; and his proposal for the Wedge of Light plaza had been incorporated as an element of Spanish-born architect Santiago Calatrava's design for the new transportation station. While the reality of the World Trade Center commission turned out to be far more complex and tangled than Libeskind may have bargained for, and while he surely will have to compromise far more than he would like, the project still offers him the opportunity to be at the helm of one of the most significant building projects in American history. The new World Trade Center could benefit greatly from Libeskind's unique ability to take lofty ideas and powerful emotions and translate them into the physical forms of buildings. Cockfield, Errol A., Jr. "Arad's Vision Reshapes Lower Manhattan." Newsday (February 23, 2004). Eylon, Lili. "Libeskind Zigzag in Berlin." Architecture Week (November 7, 2001). Goldberger, Paul. "Urban Warriors." New Yorker (September 15, 2003): p. 73. "An Interview with WTC Memorial Designer Michael Arad." Architectural Record (March 2, 2004). Lacayo, Richard. "O Brave New World!" Time (March 10, 2003): p. 58. Leonard, Devin. "Tower Struggle." Fortune (January 26, 2004): p. 76. McGuigan, Cathleen. "Daniel Libeskind Takes Home the Prize." Newsweek (March 10, 2003): pp. 58–60. Meisler, Stanley. "Daniel Libeskind: Architect at Ground Zero." Smithsonian (March 2003): p. 76. Novitski, B. J. "Libeskind Scheme Chosen for WTC." Architecture Week (March 5, 2003). 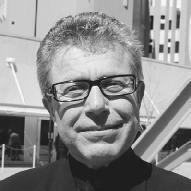 Daniel Libeskind. http://daniel-libeskind.com/daniel/index.html (accessed on May 30, 2004). Jewish Museum Berlin. http://www.jmberlin.de/ (accessed on May 30, 2004). "Memorial Design." Lower Manhattan Development Corporation. http://www.lowermanhattan.info/rebuild/memorial_design/default.asp (accessed on May 30, 2004). "Studio Daniel Libeskind." Lower Manhattan Development Corporation. http://www.lowermanhattan.info/rebuild/new_design_plans/firm_d/default.asp (accessed on May 30, 2004).